Scaffolding is one of the most frequent causes of injuries on a building site. The use of scaffolding must be carefully supervised and proper installation of the scaffolding is vital in ensuring the safety of work. Shannons have handled personal injury cases involving scaffolding that have included fractures resulting from the collapse of the scaffolding structure which would result in serious and life threatening brain injuries. The Health Safety and Welfare (Work and Height) Regulations state that an employer shall ensure work at height is properly planned, appropriately supervised and carried out in a manner that is, in so far as is reasonably practicable, safe and without risk to health. 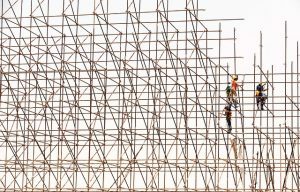 Shannons can ensure you will receive compensation where you are injured in a scaffolding accident when the employer fails to fulfil his obligations under the Act. Scaffolding provides high risk involvement for workers. Insufficiently installed scaffolding or defective components can cause serious injury and a personal injury lawyer like Vincent or Tim can research whether inadequate training, the misuse of the scaffold or inadequate safety equipment was the cause of the scaffolding collapse.